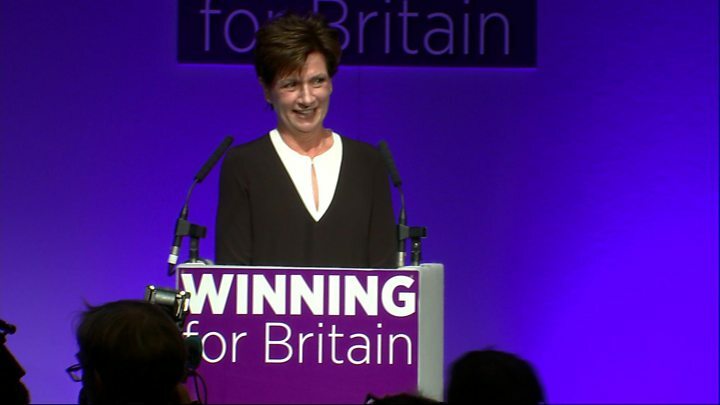 Diane James has been elected as the UK Independence Party's new leader and has told Prime Minster Theresa May to "get on with" getting the UK out of the EU. Ms James had been regarded as the favourite to succeed Nigel Farage, who quit as leader following the UK's vote to leave the EU. The MEP won with 8,451 votes. ahead of Lisa Duffy, who received 4,591. She said UKIP was "the opposition party in waiting" and said the Tories "cannot be trusted with true Brexit". "The threats to the referendum outcome are increasing by the day," she said, adding she would reject "Brexit-lite". Profile: Who is Diane James? 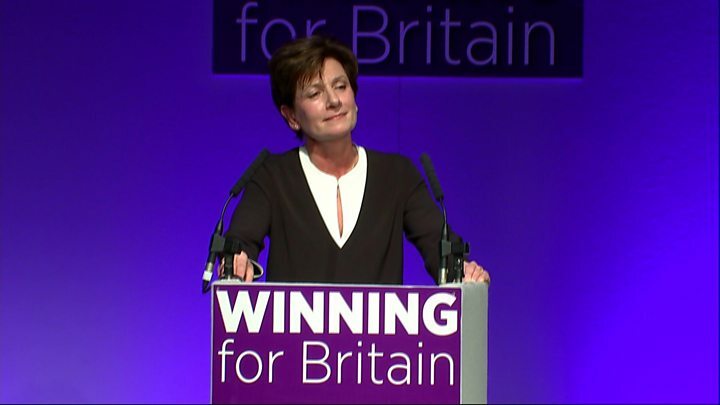 Analysis: Can Diane James unite UKIP? To applause at the UKIP conference, she said: "Yes to a 100% European Union exit. Can I be any clearer? Yes to a sovereign independent UK. Yes to a UK free to make trade deals with whoever and whenever we want and yes to an immigration policy that allows entry regardless of origin to those with the skills and the expertise and the social values that this country wants." On the referendum vote, Ms James warned that "we have only just won a heat" in a "28-member state Olympic competition to leave the European Union". She praised her predecessor and said she was "not Nigel-lite" and would not pretend to be so but would be "stepping into his leadership shoes" to try to continue his political success. Later, in a news conference, she said Mr Farage would not be a "back seat driver" and she would be "making my own decisions" but she would seek his opinion on some matters: "Why wouldn't I? The legacy he bequeathed to this party, the experience, the knowledge he has got - I would be absolutely nuts to ignore that." She was also asked about comments by outgoing deputy leader Paul Nuttall that he "fears for the very future of our party" if in-fighting that had plagued the party for more than a year could not be resolved. Ms James said she was surprised he had said that as it was an "opposition narrative" that suggested UKIP was not united and she was happy with way UKIP MEPs had worked together. She said UKIP had "moved mountains on the political landscape" and was the "change movement of the United Kingdom" and added: "I believe in UKIP's values of liberty, common sense, democracy and pragmatic approaches to the challenges this country faces." She told the party conference in Bournemouth that she might use different language and be less frank than Mr Farage, but she would be honest and "uphold all the beliefs and values that this party stands for". And, in a message to the prime minister, she said: "If you're watching this afternoon, you'll be watching the opposition party in waiting." She accused Mrs May of stealing some of UKIP's policies - such as grammar school expansion - adding: "Mrs May: from one grammar school girl to another, stop the faff, stop the fudge and the farce, get on with it - invoke Article 50 and give UKIP the best Christmas present we could ever have." She added later: "My view is the Tory Party cannot be trusted with true Brexit." Asked about her decision, within an hour of becoming leader, to remove Neil Hamilton from the list of speakers at the conference on Saturday, she said it was "my prerogative and I chose to change the programme", but denied it was a "purge". Mr Hamilton has been replaced on the agenda by Nathan Gill, the man he ousted as leader of the UKIP group on the Welsh Assembly. Mr Hamilton said it was a "rather bizarre way" to unite a party and criticised another decision to reduce the time allocated to UKIP's sole MP, Douglas Carswell. Earlier, Ms James said Mr Gill, who now sits as an independent member of the Welsh Assembly, "has my 100% support". UKIP MEP Steven Woolfe, who had been expected to stand but was ruled ineligible after submitting his papers late, told BBC News that Ms James had been "very clear that she wants to make UKIP a winning machine". "I hope and I believe that she will take the party forward," he said. But Labour MP Pat McFadden, a member of Open Britain - born out of the unsuccessful Remain campaign during the referendum - said: "UKIP may have a new leader but the same questions apply about the UK's future outside the EU. "Will she press for the £350m a week extra pledged by the Leave campaign for the NHS? Will she campaign for their other promises to be met?" Mr Farage stood down following the UK's vote to leave the European Union, saying his "political ambition has been achieved". The face of Euroscepticism in the UK for nearly two decades, he helped turn UKIP from a fringe party into the third biggest in UK politics - in terms of votes at the 2015 general election. He also helped persuade more than 17 million people to vote to leave the EU. Ms James, a former businesswoman and healthcare professional, saw off four other contenders: Bill Etheridge, Lisa Duffy, Liz Jones and Phillip Broughton.